These Sally Hansen Color Quick products are the answer to on the go girls. These sleek black pens with bold white writing and the colour clearly shown at the bottom are sure to be a hit with collectors. I've had these a few months now and forgotten about them, but rushing to get ready for a party I noticed my nails weren't painted. And they are never left unpainted!! After my drama queen moment I realised I had these, grabbed them and ran out the door. I wasn't sure how these would turn out but I had no choice. 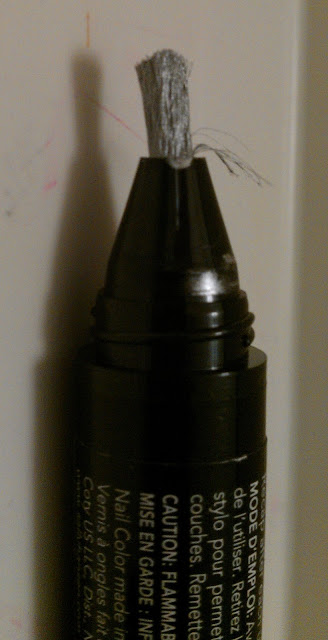 Unscrewing the handy cap I stared at the brush, unlike most varnishes the bristles were white and a lot more thicker. The screw cap was so handy and didn't make me think twice about it spilling in my purse. Once I pressed down on the end of the pen a few times - The button that is the shade of the nail varnish - The colour came flowing effortlessly through. 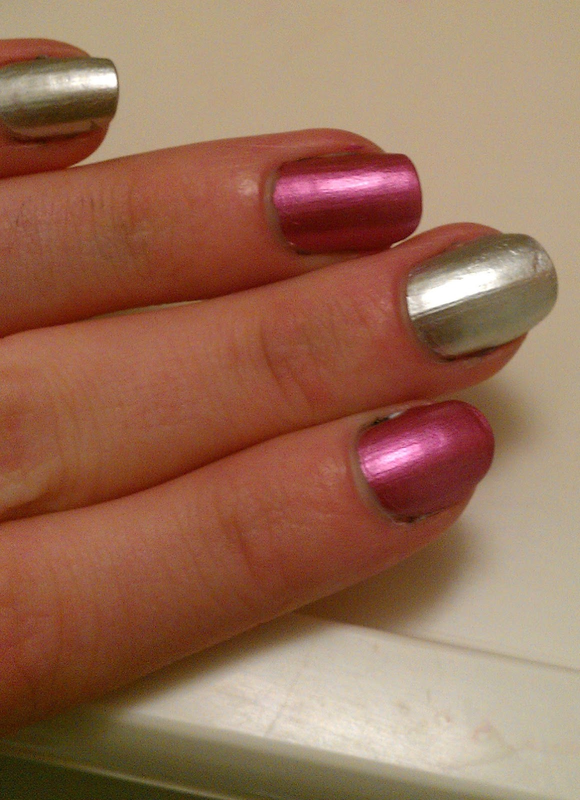 I used the silver one to match my black dress and began to paint my nails. I was really puzzled by its watery texture as it glided on so well and was packed with colour. I only needed one coat which is just unbelievable. The shine on the metallic colours are devine, as you can see with the colours below they just seem to catch such a shine. I am still in shock of how well the colour was achieved. Because of how watery the formula is my nails dried in seconds. 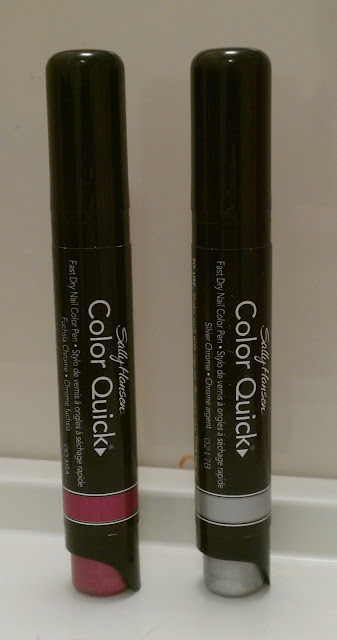 It really is Color Quick! The only bad point I have is because of it's watery texture, as you can see below it shows any defects in the nails, such as ridges or chips. The staying power was average, nothing better or worse than the usual drug store nail polishes. Also I found that removing the nail varnish was a dream. No scrubbing the nails with the cotton, just a few swipes and it was gone. Overall I think every girl should have at least one of these. It's fast drying and available in a wide range of different colours, from french manicure shades, metallics and pastels. It also has perfect packaging, a small pen which is perfect for on the go. The watery yet pigmented formula means it's easy for touch ups with out uneven services. An absolute win from Sally Hansen. I actually picked mine up in Poundland, so I am so happy. You can get them on Ebay, beauty Outlets for around £2. Find some more information here from Sally Hansen. If you find these in your nearest Poundland, get every colour they have - You wont be disappointed!! 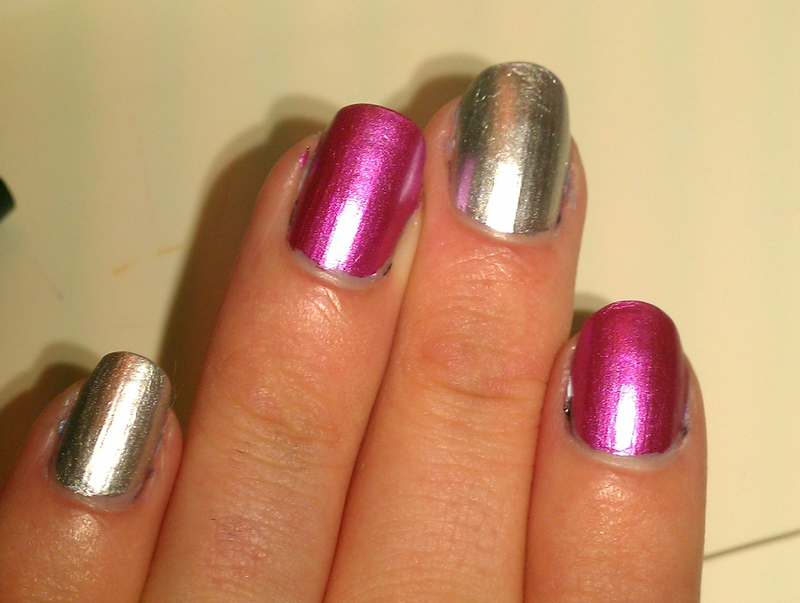 The colours shown here are Fuchsia Chrome and Silver Chrome. Do these appeal to you? Have you tried any Sally Hansen products? Wow they look amazing, so pigmented! I'd never heard of these but definitely going to keep an eye out for them now, I hate waiting for my nails to dry and there's nothing worse than getting ready to go out and realising you've neglected your nails!! I'd much rather use something quick & easy like this, I'm so lazy when it comes to my nails! Wow, these look amazing! I've never even heard of them but I'll definitely be on the lookout for them now! These are such a great idea, gonna hunt them out! Wowww! These are amazing! Definitely gonna pop into Pundland next time i'm in town! I'm gonna need to find that silver colour! It's nice to see a silver that's smooth rather than full of chunky shimmer and glitter!